Increase local wealth that recirculates within the community Preserve local character Build community Create good jobs Have a say in policy-making Decrease environmental impacts Support entrepreneurship Improve diversity/variety Compete with big businessesDo Buy Local campaigns actually work? 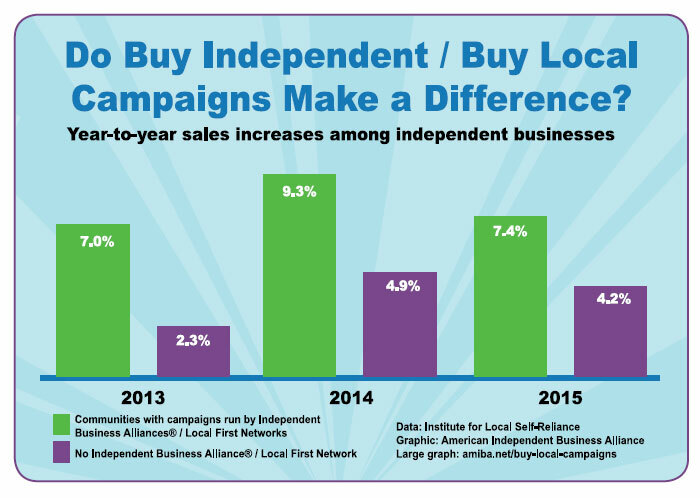 First, find out if a Go Local/Shop Local/Buy Local/Stay Local campaign already exists in the business’ community. If so, the client can join up. If not, contact AMIBA. The good folks there will know if other local business owners in the client’s community have already expressed interest in creating an alliance. They can help connect the interested parties up. I highly, highly recommend reading through Amiba’s nice, free primer covering just about everything you need to know about Go Local campaigns. Encourage the client to publicize their intent to create an alliance if none exists in their community. Do an op ed in the local print news, put it on social media sites, talk to neighbors. This can prompt outreach from potential allies in the effort. A given group can determine to go it alone, but it may be better to rely on the past experience of others who have already created successful campaigns. AMIBA offers a variety of paid community training modules, including expert speakers, workshops, and on-site consultations. Each community can write in to request a quote for a training plan that will work best for them. The organization also offers a wealth of free educational materials on their website. According to AMIBA’s Jeff Milchen, a typical Buy Local campaign takes about 3-4 months to get going. 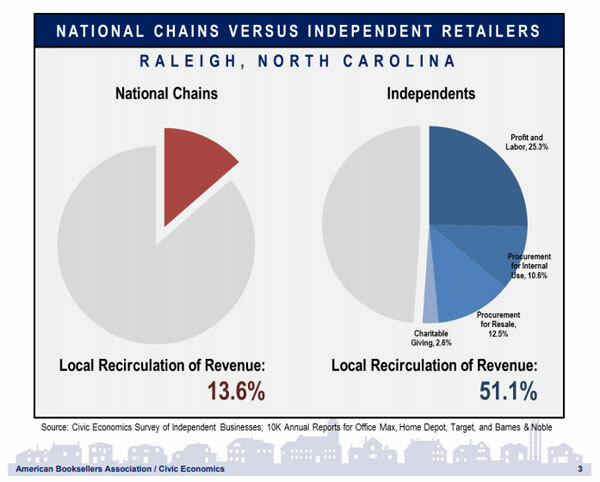 Codify the definition of a “local” business as being independently-owned-and-run, or else big chain inclusion will anger some members and cause them to leave. Emphasize all forms of local patronage; campaigns that stick too closely to words like “buy” or “shop” overlook the small banks, service area businesses, and other models that are an integral part of the independent local economy. Ensure diversity in leadership; an alliance that fails to reflect the resources of age, race, gender/identity, political views, economics and other factors may wind up perishing from narrow viewpoints. On a related note, AMIBA has been particularly active in advocating for business communities to rid themselves of bigotry. Strong communities welcome everyone. Do the math of what success looks like; education is a major contributing factor to forging a strong alliance, based on projected numbers of what campaigns can yield in concrete benefits for both merchants and residents. Differentiate inventory and offerings so that independently-owned businesses offer something of added value which patrons can’t easily replicate online; this could be specialty local products, face-to-face time with expert staff, or other benefits. Take the high road in inspiring the community to increase local spending; campaigns should not rely on vilifying big and online businesses or asking for patronage out of pity. 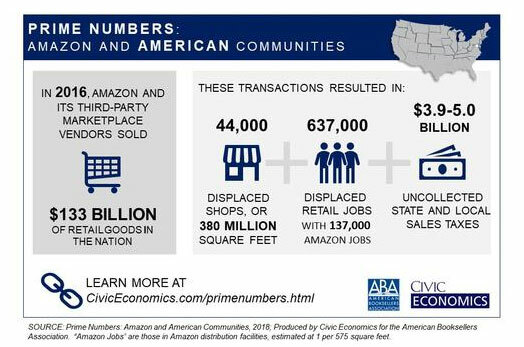 In other words, guilt-tripping locals because they do some of their shopping at Walmart or Amazon isn’t a good strategy. Even a 10% shift towards local spending can have positive impacts for a community! Clearly assess community resources; not every town, city, or district hosts the necessary mix of independent businesses to create a strong campaign. For example, approximately 2.2% of the US population live in “food deserts”, many miles from a grocery store. These areas may lack other local businesses, as well, and their communities may need to create grassroots campaigns surrounding neighborhood gardens, mobile markets, private investors and other creative solutions.